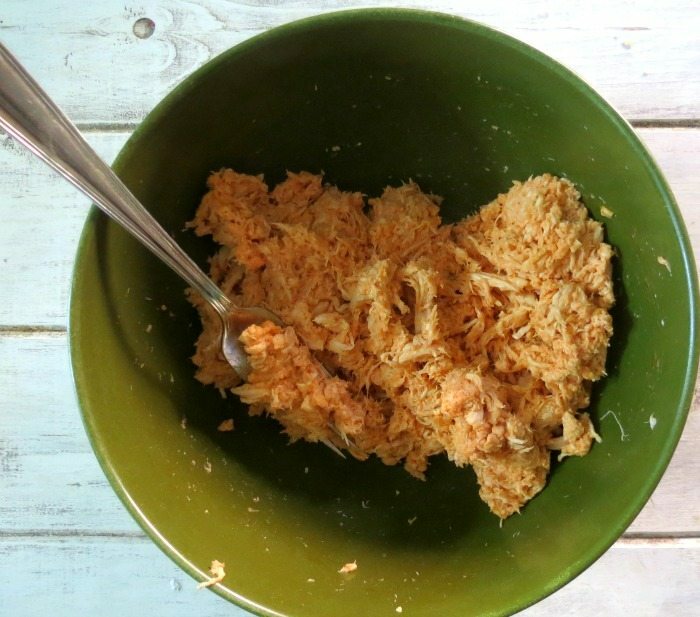 Now that football season is here, I can start making my favorite kind of finger foods to eat during the big game. One thing I absolutely love is Buffalo Chicken Wings. Mmmmm, one of my all time favorite indulgences. Today I took my favorite little chicken wings and turned them into a quesadilla that perfect for eating during my beloved football games. Want to hear a little football fact? People who watch the game tend to eat more if there team is losing. Crazy! I don’t care if my team wins or loses, I still like to eat. Matter of fact, that is why I love football! All of that yummy food. My Buffalo Chicken Quesadillas turned out perfectly. 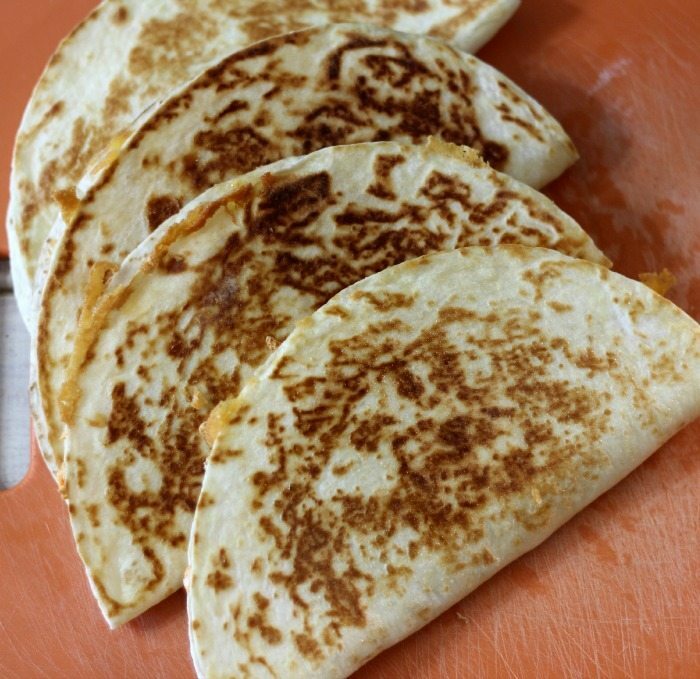 Just enough heat to give it a zing, it’s cheesy, super quick to make and I love the flavor of a grilled flour tortilla. I made 16 quesadillas in less than 10 minutes. It takes more time to mix the chicken than anything else. 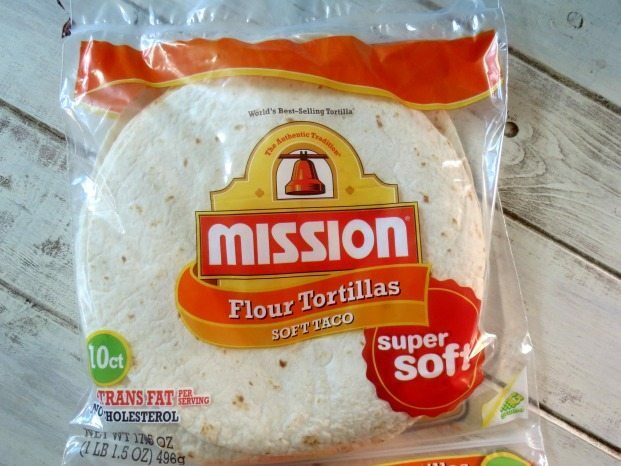 The first thing I did was purchase Mission Flour Tortillas. They are super soft, pliable and have great flavor. I have to admit they are my favorite tortillas to use. They are perfect for tacos, burritos, quesadillas and just about anything you love to wrap. They are located at grocery stores all over the country. The next thing I did was take 2 cups of already cooked chicken and mixed it with about a 1/3 cup of Franks Hot Sauce. You must use Franks Hot Sauce to get real Buffalo chicken wing flavor. You can grill, or saute your chicken or buy a chicken rotisserie and just shred the breast meat. You can also cook the chicken in advance and use it within a couple of days. This makes a time-saving idea. For the next step I sprayed a large skillet with cooking spray. I placed it over low heat. I added one 10″ Mission Tortilla and spread a 1/4 of my chicken on one side of the tortilla and topped it with 1/4 cup of shredded cheddar cheese. Then I folded my tortilla over to make it half-size. I cooked it for about 2 minutes per side. Just be careful when you flip it. You don’t want to lose any of your cheese. I made each tortilla before I plated them. I placed them on a cooking board and used a pizza cutter to cut each one into 4 pieces. 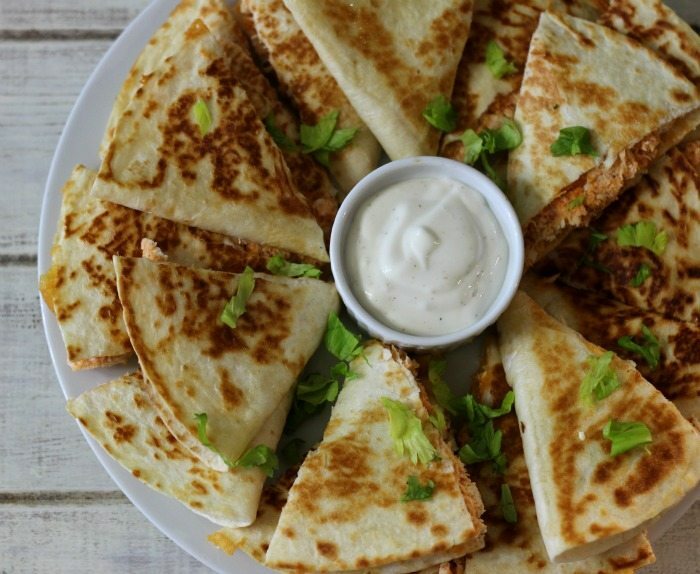 The recipe makes 16 quesadillas. They are pretty filling! I think they will be a huge hit with friends and family. As I write this post I am snacking on my quesadillas. They are good piping hot or at room temperature. I served them with Ranch Dressing but you can also use Blue Cheese Dressing. 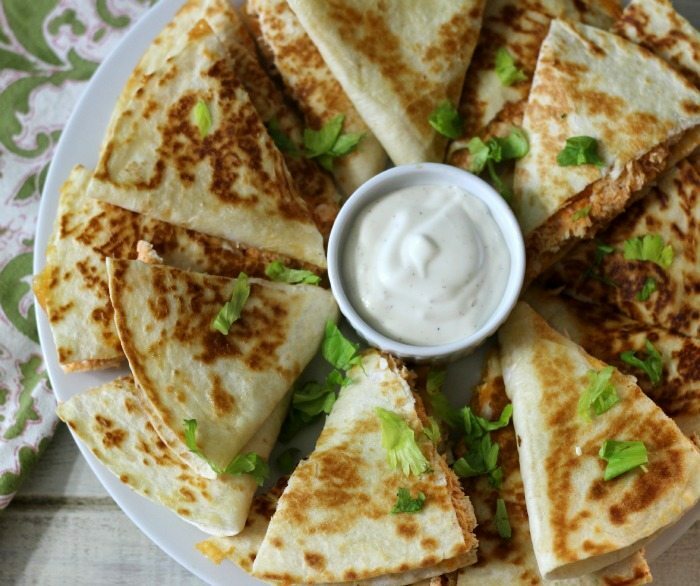 Cheesy, spicy, Buffalo wing flavor quesadillas served with Ranch Dressing. In a medium bowl, add chicken and hot sauce. Mix until combined. Spray a large skillet with cooking spray over low heat. Add the Mission Flour Tortilla and add ¼ of the chicken to one side of the tortilla. 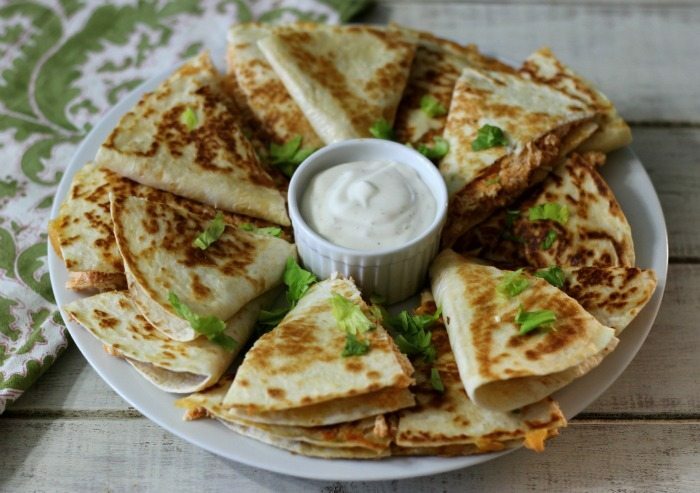 Top chicken with cheese. 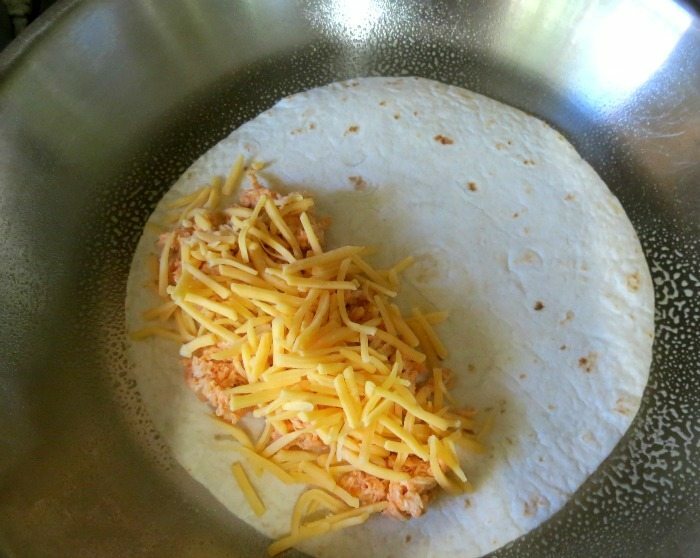 Fold the tortilla over the chicken and cheese to make it half the size. Cook each side for about 2 minutes until the cheese is melted. 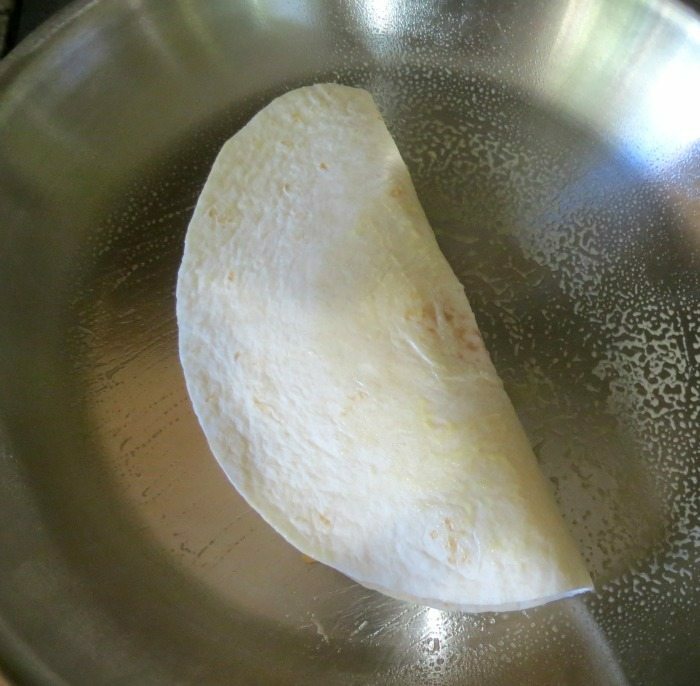 Place cooked tortilla onto a coking board. Repeat with remaining ingredients. 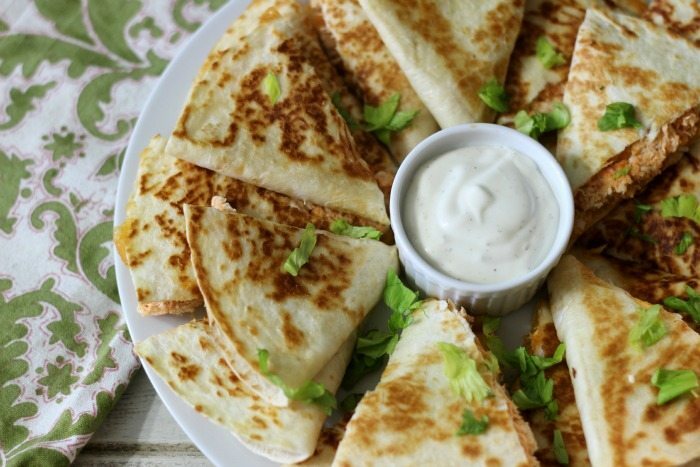 Cut the quesadillas into 4 wedges. Place on a platter and sprinkle with celery leaves. Serve with Ranch or Blue Cheese Dressing. You can cook the chicken in advance or use a rotisserie chicken. There are some foods that just get you all excited and I have to admit this is one of them for me. Super easy, a crowd pleaser and great to have anytime of the week. 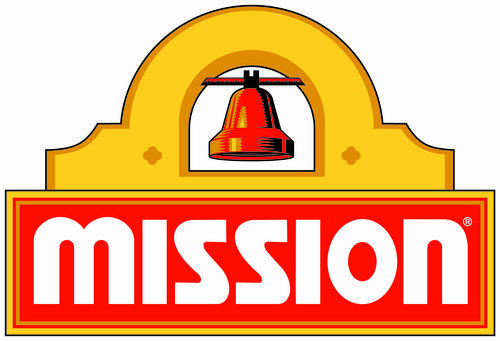 Want to get great recipes, coupons and prizes with Mission Tortilla? You can join the Mission Insiders Club. It’s a lot of fun and I joined. This post is sponsored by Mission Food Services.